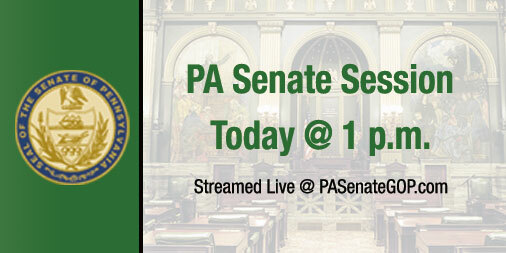 Senate Session Convenes Today at 1 p.m. Legislation sponsored by Sen. John DiSanto (R-Dauphin) to ensure that public employees who commit job-related felonies are stripped of their taxpayer-funded pension was approved Wednesday by the Senate with House amendments and is now on its way to the Governor’s desk. The Governor has 10 days from passage to act on the bill and has said previously that he supports the legislation. A measure intended to better secure state funding for the Civil Air Patrol received final Senate approval and was sent to the House of Representatives for consideration. Senate Bill 128, sponsored by Sen. Mike Regan (R-Cumberland), codifies the Civil Air Patrol’s state operations in Title 51 under the leadership of the Adjutant General. The Civil Air Patrol is the official auxiliary of the U.S. Air Force and has three core missions – Aerospace Education, Cadet Programs, and Emergency Services (Search & Rescue, Disaster Relief, and Counter-Drug Support). The 55 Civil Air Patrol units in Pennsylvania work alongside state police, fire, and other emergency personnel to help save lives. Senate Transportation Committee Chair Kim Ward (R-Westmoreland) said Wednesday she will spearhead efforts to confront the major challenges facing Pennsylvania’s transportation system. Senator Ward announced that she will put together a legislative working group to draft legislation to end Pennsylvania Turnpike Commission transfer payments to PennDOT and to develop a legislative plan to empower public transportation. Sen. Camera Bartolotta (R-Washington) announced bipartisan legislation Wednesday to expand job training programs to a broader number of Pennsylvanians by allowing Private Licensed Schools to create branch campuses in different counties. In recognition of the incredible accomplishments of individuals living with Down syndrome, Sen. Scott Martin (R-Lancaster) led passage of a Senate resolution designating Wednesday, March 21 as World Down Syndrome Day. Senate Bill 128 codifies the Civil Air Patrol’s state operations under the leadership of the Department of Military & Veterans Affairs. Senate Bill 234 is the General Fund Budget for Fiscal Year 2019-20. Senate Bill 235 provides Fiscal Year 2019-20 funding for the Bureau of Professional & Occupational Affairs. Senate Bill 236 Workers’ Compensation Act and Pennsylvania Occupation Disease Act funding for Fiscal Year 2019-20. Senate Bill 237 provides Fiscal Year 2019-20 funding for the Office of the Small Business Advocate. Senate Bill 238 provides Fiscal Year 2019-20 funding for the Office of the Consumer Advocate. Senate Bill 239 provides Fiscal Year 2019-20 funding for the Public School Employees’ Retirement Board. Senate Bill 240 provides Fiscal Year 2019-20 funding for the State Employees’ Retirement Board. Senate Bill 241 provides Fiscal Year 2019-20 funding for the Philadelphia Parking Authority. Senate Bill 242 provides Fiscal Year 2019-20 funding for the Pennsylvania Public Utility Commission. Senate Bill 243 State Gaming Fund appropriations funding for Fiscal Year 2019-20. Senate Bill 244 provides Fiscal Year 2019-20 funding for Penn State. Senate Bill 245 provides Fiscal Year 2019-20 funding for the University of Pittsburgh. Senate Bill 246 provides Fiscal Year 2019-20 funding for Temple University. Senate Bill 247 provides Fiscal Year 2019-20 funding for Lincoln University. Senate Bill 248 provides Fiscal Year 2019-20 funding for the University of Pennsylvania for veterinary activities and for the Center for Infectious Diseases. Senate Resolution 34 establishes a Global Education Task Force. Senate Bill 440 provides for flexible instruction days. House Bill 18 authorizes the release of Project 70 restrictions on land owned by the Borough of Topton, Berks County, in exchange for the imposition of the restrictions on other land to be acquired by the borough. The bill also provides for land conveyances in Chester, Lehigh and Monroe counties. Senate Bill 139 amends the Pennsylvania Price Gouging Act to ensure that a Governor’s emergency declaration does not place an undue and unnecessary burden on operations and businesses outside of and unrelated to the disaster. Senate Bill 146 makes online training more available to current and prospective first responders. Senate Bill 439 expands the Pennsylvania Heart and Lung Act to include several law enforcement entities that are not currently protected by this coverage.